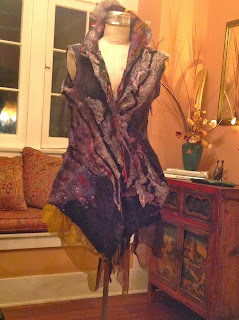 The inspiration for this nuno felted seamless vest came from an old silk scarf that I picked up in a thrift shop. I was attracted to it because of the single red rose along with some cursive writing on the sheer silk. 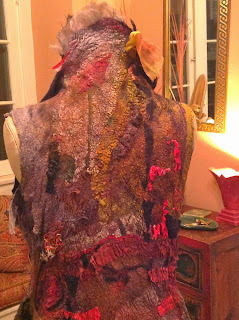 It felted in beautifully. 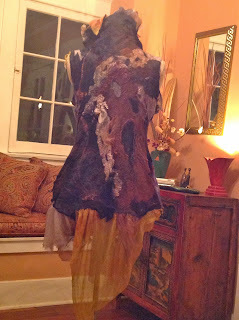 I used a resist to make the seamless vest. I started my layout with the inside of the back. 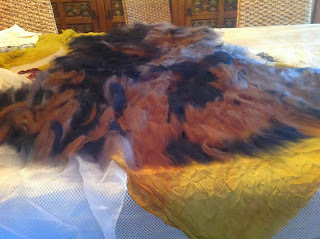 Then did the inside of the front, the outside of the front and flipped it over to finish the outside of the back. Showing both fronts of this reversible vest. I am so thrilled to have found you and your fabulous felting work!! 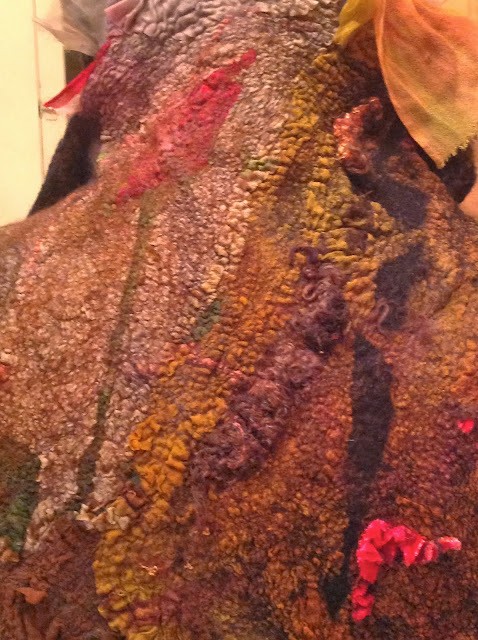 I am developing my skills as a felt collage textile artist. 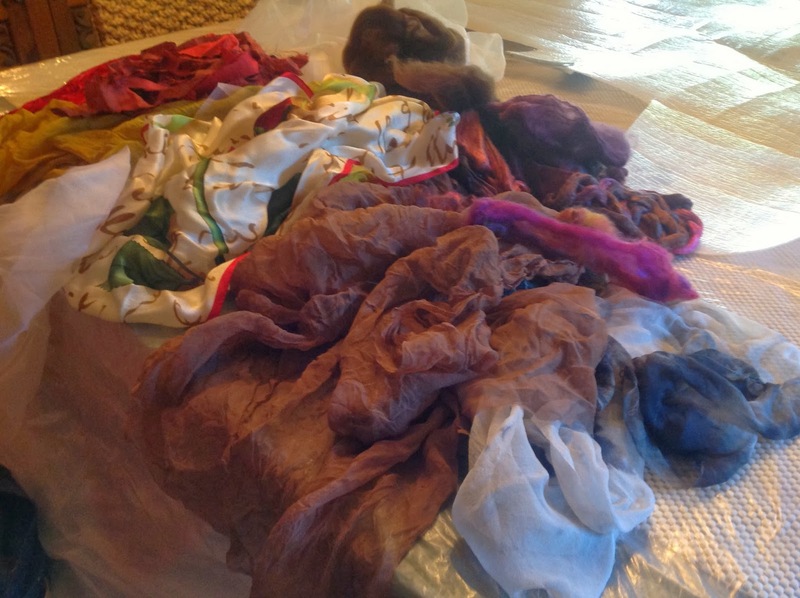 I like to throw it all together and see what comes out in the wash so to speak.. I work with reclaimed (read GoodWill and thrift shop) fabric finds and merino wool and silk fibers. 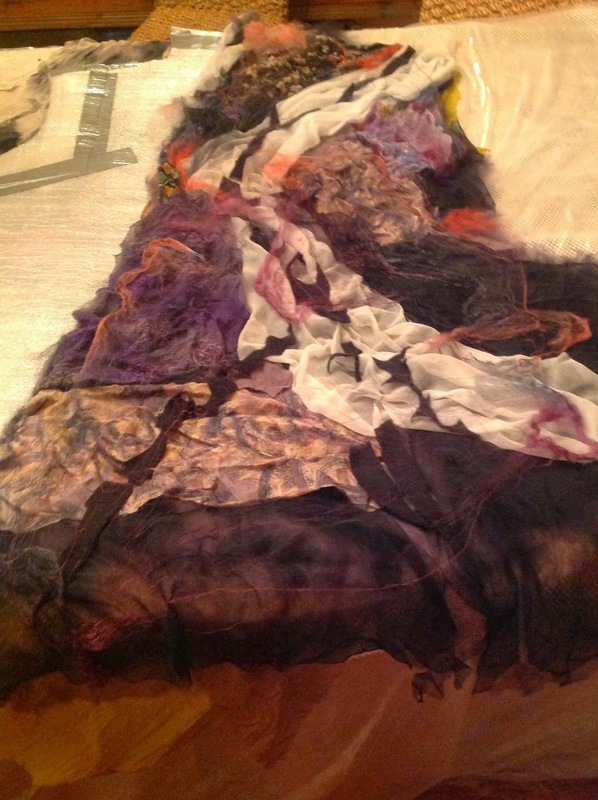 I make collage scarves that are found silk gauze glued together with silk and wool fibers- definitely one of a kind!! 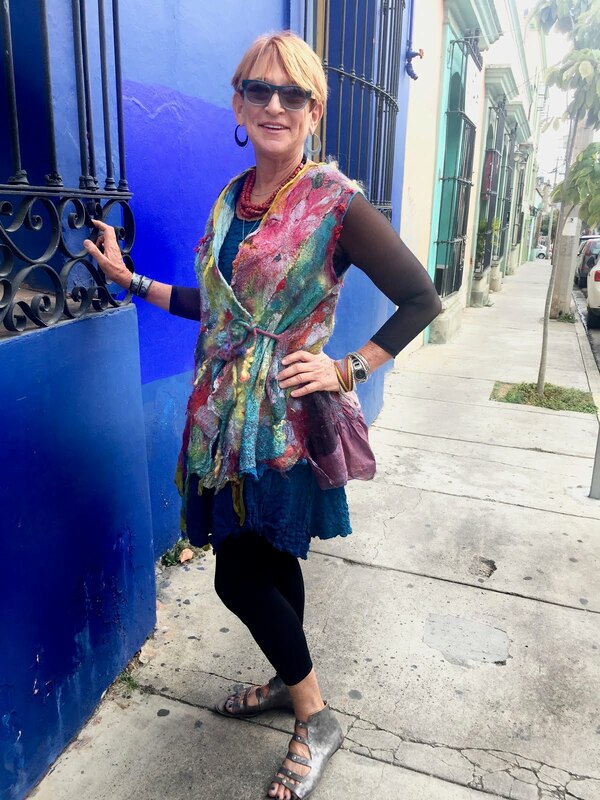 I wish I was on the west Coast as I would be taking part in all of your workshops!! 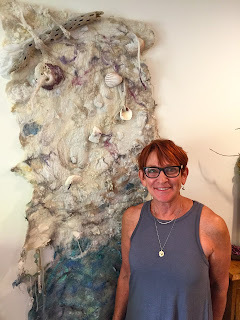 I will be following your blog and please do let me know if You are ever coming to the east coast as I am sure that I could line up a workshop or two for you to teach!!! Great vest. the shape is wonderful, not boxy like so many. How do you get the cross over in the front. for me the front shrinks as much as the back so no cross over. Great vest. the shape is wonderful, not boxy like so many. How do you get the cross over in the front. for me the front shrinks as much as the back so no cross over. Sorry if you get this more than once but I am not sure if it went through or lost it when it did my ID. please delete it if it did . 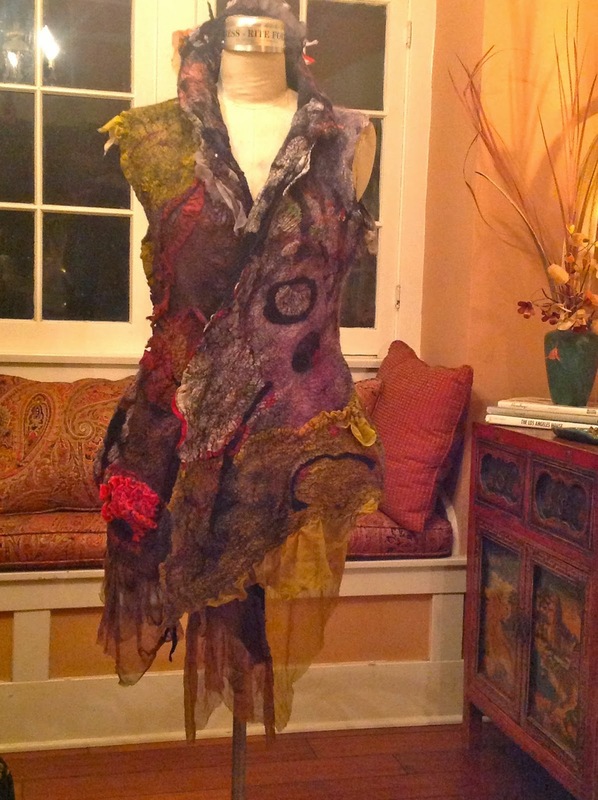 OMG I am blown away by your creations. I have just started in my discovering of the beauty of felting and the relaxing effect it has on me. Your work is over the moon and beyond thank you for sharing.